While sipping and swirling, Barbara can be found hosting wine events and judging competitions around the world, as well as recommending wines to CBC's On The Coast listeners. Want to be her? Here's how she got there. Marlisse Silver Sweeney Journalist, eater, shoe-collector, wine-drinker, avid news-consumer, occasional runner and professor. When you read Barbara Philip's biography, it sounds like she has the best job in the world. She's a category manager for B.C. 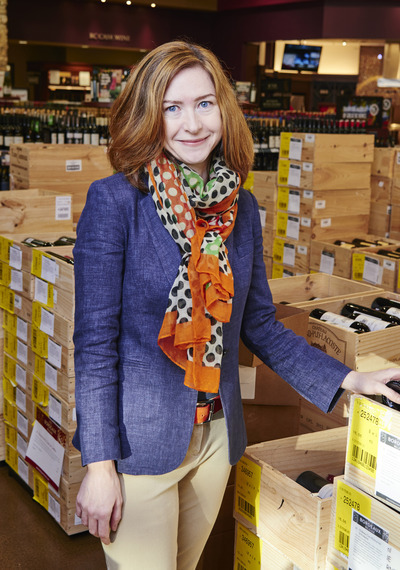 Liquor Stores, where she's responsible for buying European wines and she also runs a wine consulting business with her husband, Iain Philip. This conversation has been edited for conciseness and clarity. Marlisse: What does a typical day look like for you in your job? Barbara: It really depends. For instance, today I was in the office, I was reviewing wine list applications. I tasted about 25 wines to see if they were suitable for the stores. Yesterday, I was in Victoria all day doing a tasting with product consultants and managers. I do a lot of training for B.C. Liquor Stores, but then I also spend a lot of time in the office. I don't know if there is a typical day! Of course I travel a lot, both to trade shows and going on trade missions, buying trips, educational tours, that kind of thing. M: Are you travelling mainly to Europe because you're the European buyer for B.C. Liquor Stores? B: For B.C. Liquor Stores I travel mostly to Europe. I also look for other opportunities with the consulting side of the business, to judge or to do work that takes me to regions outside of Europe. For instance, last year my husband and I went to Argentina on an educational trip and I was judging as well. I always look to do at least one of those a year. M: What are some differences between the European and B.C. wine cultures? B: It's easier. If you look at Spain or Italy or France or even in parts of Germany where they produce wine, wine is not such a big deal. It's a part of life. It's something on the table. It's another food group and people are not so nervous about it. In B.C. and North America in a greater sense, we think that it's something intimidating that has to be learned about. We think it's a big deal. It's much more casual in Europe. It's not seen as an everyday drink for us, yet. M: Has wine always been your beverage of choice? B: Yes, it really has. Even when I was a university student, I always preferred wine. M: Did you grow up in a household where kids were allowed to sip wine with dinner? B: Definitely. My parents are from British descent, so we didn't have a wine-drinking culture as much as somebody from Southern Europe might have. There was always wine there, but it wasn't a huge culture. But certainly as far as alcohol and having a little bit of wine with meals, as far as I remember, I was always allowed to participate. M: How did you get into the industry? B: I took a degree in theatre at UBC. Of course, as I was working in theatre, I was always working in restaurants at the same time. It just happened that after years and years in the restaurant business I was gaining all the skills and also a real love for the wine industry. I met my husband and we were preferring to take vacations that were in wine regions. We were talking to producers; we were starting to take classes and really gain a knowledge and an appreciation about wine. My interest in the restaurant industry was always in the front of house. What presented the greatest pleasure and the greatest challenge intellectually was the wine, so I decided to dedicate myself to that and get proper training. M: I wanted to talk to you about your training. It's a phenomenal accomplishment. You're the first Western Canadian to receive the prestigious Master of Wine designation and the only woman in the country to have it. How did you decide to take that on? What was that process like? B: It's something that I always wanted, because I thought of it as the pinnacle of wine education. To lead up to it, I took the courses from Wine & Spirit Education Trust. It was seen as the prerequisite for starting a Master of Wine. That's where you get your basic knowledge about wine: the appellations of the world, wine-making and grape growing. Master of Wine is not really an in-class program. You go to two residential seminars before you write the exam. They take the knowledge you already have and hone it so you can pass the exam. The exam is a series of essays. A lot of them are based on business and current events, and then the tasting. M: Have you always had a really good palette? Obviously you've worked on it, too, but is it something that you were naturally born with? B: I don't believe so. I think that wine tasting and recognizing things in wine is being able to put them together and come to a logical conclusion about the wine -- about its quality, or if you're tasting blind and trying to identify it. I absolutely think it's a learned thing. It's more about organizing your thoughts and remembering, doing the analysis of the characteristics, which most people can do. In my anecdotal experience, I haven't seen anyone who really can't get something in the wine... if they can't get it, it's just because no one has directed them or pointed it out to them before. M: When you received the MW designation in 2007, would you say that opened more doors -- or barrels -- to you? B: It's hard to say, but with judging or a contract, people will specify they want a Master of Wine for it, so that does open those doors. Having said that, in North America in particular, because there are so few of us still, there isn't a lot of recognition yet. M: Ann Matasar writes in her book, Women of Wine - The Rise of Women in the Global Wine Industry, that historically appreciating wine was equated with masculinity. She gives the example that in Australia, women were excluded from being judges on wine tasting panels until 1983. Have you encountered any kind of bias as a woman in the wine industry? B: If it was a bias, it was a bias in my favour. When I first started pursuing wine professionally, it was about 20 years ago, there weren't many women established in Vancouver or internationally. It's always been a really strong point of difference for me, to my advantage. Maybe it's just timing. M: What advice would you give people looking to get into the wine industry in this province? B: Definitely education. People look when they're hiring for some kind of designation. People can look right away at your resume and know you have a basic level of knowledge. I also think it's not the whole picture. If people really are serious about getting into the wine industry, they need to work in it. If they're interested in being a sommelier, they need to get a job in the restaurant and that's probably not going to be running the wine list straight out of the gate. There are lots of jobs in retail where they can gain experience. For importers, they can work on a sales team. People are willing to take the education, but not always willing to get the on-the-job training. They want to come in as a buyer for B.C. Liquor Stores with no retail experience or be a sommelier without having worked at a restaurant. M: What would be your last glass of wine, as opposed to your last meal? Probably a nice glass of Champagne. A little toast to a life well-lived.